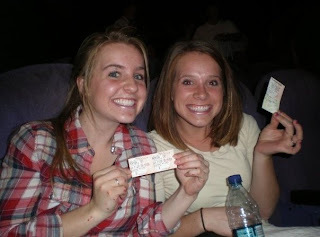 My sister, Kelli, and I have been wanting to see the Proposal for SO long now. Before we got a chance to see it at the regular theaters, it stopped showing...but then it didn't make it to the dollar theaters until like four weeks after that! FINALLY it came to dollar theaters on Friday so we saw it Saturday night and it was GREAT...minus one totally unnecessary, inappropriate part. :/ But it was so funny and so cute!